One thing I have learned over the years is that my first impressions of a scene may not inspire me as a photographer at first sight or maybe my first impression is that I do not believe I can make a good image due to the current conditions. But I have several images that I have taken over the years that I took without much thought or work, just because I was there, that have actually become favorites of mine after I revisited them. Sometimes weeks or even months later, this image is one of those. 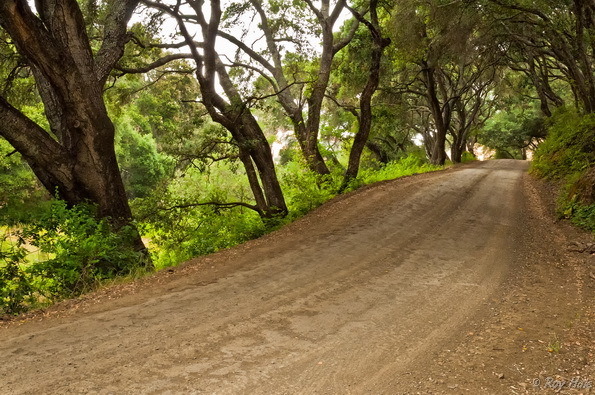 We were heading back after a day of shooting and were taking some of the dirt back roads outside of San Luis Obispo, California. It was fairly late in the day, about 7:00 PM, and we came upon this canopy of trees over the road. I was tired and was really looking forward to getting back to the hotel and getting some dinner, but several of the photographers with me that day wanted to stop and do some flash photography. Upon exiting the vehicle I looked up the road and was not inspired with the scene. It was very dark, as the sun was getting quite low, and the trees were creating dark shadows. So, while the other set about setting up for some flash portrait photography beneath the canopy of trees I wandered a short distance off the side of the road and took a few shots of the trees, again not really finding any inspiration in the scene. I then waited for the others to finish up and once everyone had completed their shots and we were all getting ready to load back up into the van I glanced up the road and decided to go ahead a take a few shots. I made a few quick adjustments to my camera and using aperture mode, auto ISO, and manual white balance composed a few shots and got into the van. Later that evening, while reviewing my shots from the day, I came across these images and again really didn’t think I had any worthwhile images. Several weeks later however as I was going through my images from these few days of shooting, I again came across these shots and found myself getting drawn into this image. The way the road seemed to grab my attention and lead my eyes into the scene as though drawing me into an inviting tunnel. The green and yellows from the foliage seeming to glow from the sunlight, now weeks later I found I really liked this image. So a few minutes were spent processing the image and it was added to my landscape gallery. Several months later I was looking thorough my images for any I thought would be good candidates for conversion to black and white, and again found myself looking at this image in an entirely new way. I have always been a big fan of black and white and found this image intrigued me but in a very different way than when viewed in color. While the color image invoked thoughts of strolling down a country lane in the early evening warmth of summer, in black and white it invokes darker thoughts of being caught alone and isolated out in the country. I really can’t decide if I like the color or the black and white image better as they elicit just different emotions when I view them. As such you will find this image is both my landscape and black and white galleries. What I have learned from this image, and others, is that when I first look upon a scene I should not necessarily trust my initial judgment. I need to take the time to really look at the scene, free my mind, and let the scene invoke feelings or emotions. Only then will I truly know if the scene is worth the time to capture or not. In addition, I also now always tried to spent the time to capture images from whatever scene I come across, just because I am not necessarily inspired initially it may just take a few viewings or time to pass before I ‘get it’.